"MJ has a fantatsic voice of her own and she is doing marvels with mine ..."
"MJ brought out the best in everyone, improving their tone and confidence ..."
"Voice is the instrument within all of you. Play with it, get to know it. Don't have a life without singing in it." 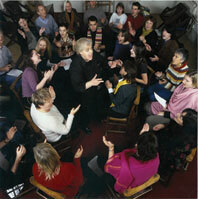 MJ Paranzino's group vocal workshop, and one-to-one vocal coaching, is an opportunity for singers of all levels to learn professional vocal technique, and explore the power and range of their own voices. MJ is a professional vocal coach with over twenty years experience working with professionals on Broadway, boy bands, indie groups, opera singers, rock stars, chief executives and captains of industry, as well as actors, journalists, teachers and public speakers. There is also a growing body of evidence on the health benefits associated with singing - you can watch MJ in action and hear her views on the benefits of singing on the BBC News website. For more information about MJ, her vocal one-to one coaching or group workshops, visit: www.mjparanzino.co.uk or call 07837 374 705.